Are you having trouble changing your keyboard settings? At times people just want to change from the UK style of US, or vice versa, depending upon their needs. You can also change the overall language of your keyboard from English to French. Moreover, some people like to use a certain type of keyboard such as Dvorak; for that they also need to go through the same steps. However, the process to do this is different in different operating systems. If you are using Windows, it will have a different process as compared to a Mac. Click on system preferences icon in your dock. If you can’t find it, then simply click on the apple shaped logo right at the top left corner and then click on system preferences. Once you have entered the system preferences, simply click on language and text and a new tab will open. You will notice that there will be a list of languages for you to choose from. In case you don’t want to set a single language for your keyboard, you can check more than one option. If you want to scroll through these different languages, simply check “show input menu in menu bar” option. This will display a flag in the menu bar while you are using your computer. Once you click on this flag, the drop menu will reveal all the languages which you have checked here. You can click on any one of them and your keyboard will start typing accordingly. On the desktop, click on the start menu and open up the control panel. You will notice that there will be “date, time, language and regional options” on this page. Click on them and wait for the new page to open. In the new page, click on regional and language options. Once the new tab has been opened, click on the languages tab. Open the details tab and you will see that there is an option to not only choose a new language, but also to add a new keyboard, or change the current one. 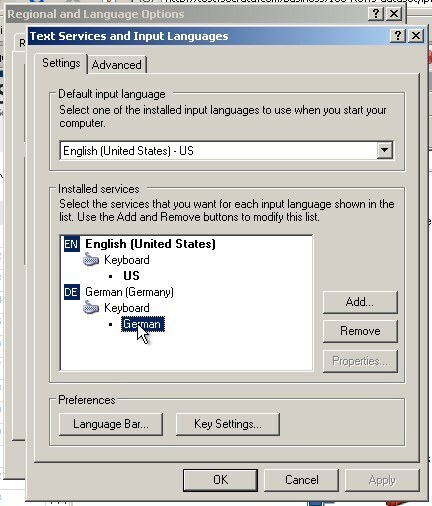 If you want to add new keyboard settings, simply click on add and scroll through a list of different languages which have been offered by Windows. Select the keyboard of your choice and close the tab by pressing okay.